In your career, you might have worked in both nonprofit and for-profit sectors. There’s so much richness in both worlds. And to be able to work in both at some point in your career gives you great perspective. Sometimes people take for-profit communications strategies and wedge them into nonprofit communications. It happens the other way around too, albeit not as often or visibly. But can the communications strategies used in for-profit also work in nonprofit? The quick answer is yes, with a twist. When you get down to it, corporate and internal communications in both for-profit and nonprofit sectors tie back to the same goal. Both seek to create mutually beneficial relationships that lead to a sale of a product or service. Although some nonprofits sell products, their focus is most often on building relationships with people who’ll benefit from their services or those who’re interested in donating their time or treasure to help improve or grow those services. And that mutually beneficial relationship starts with effectively communicating your nonprofit mission. In other words, why the organization exists, who it serves and how it serves. In our experience, both nonprofits and corporations have a hard time narrowing what to say in a mission statement. They often want to throw everything and the kitchen sink into it. But as the adage goes, “If you don’t stand for something, you’ll stand for anything or, worse, everything.” Your mission statement must be succinct. The communications team—the public relations and marketing pros—in a nonprofit organization can be a valuable ally in crafting and vetting your mission statement. Take a look at these mission statements. How does your organization’s mission statement stack up to the clarity and crispness of these? Heifer International works with communities to end world hunger and poverty and to care for the Earth. Hopefully, these serve as good reminders of why it’s important to spend time honing your mission statement as well as your vision statement and values. These three elements serve as anchors to your organizational messages. Regardless of whether you’re trying to connect with employees, prospective or current donors, or volunteers, it’s important that nonprofit organizations have strong key messaging. And it should be tailored based on the audience. Writing with the audience in mind is imperative. For example, donors care about the finances of your organization. A lot. So you should focus on consistently communicating how you were good stewards of their donation. How did you use the funds entrusted to you? As reported in Philanthropy Journal News, many studies show how important trust is to the act of philanthropic giving. Twenty percent of respondents in a 2014 study by the BBB Wise Giving Alliance said the most important thing donors consider when deciding to give is a nonprofit’s overall honesty and ethics. Other studies, such as the Millennial Impact Project study, found that 90 percent of consumers age 20-35 said they’d stop giving to a nonprofit if they did not trust the organization. We’ve written about the topic of trust and authenticity in communications before. And in some ways, nonprofit organizations have a higher bar to clear with organizational trust than corporations and other for-profits. While donors care most about organization trust, volunteers care about how they can impact your customers or members. They want to know whether they’ll directly interact with customers or clients. And last but not least, prospective and current employees want to know how the organization’s work is making a difference. They also want to know the long-term vision of the organization and where they fit in. What’s different about the service, mission, etc. For more information on writing strong key messaging, be sure to check out our recent blogpost. One message that never goes out of style is “thank you.” From a communications standpoint, this phrase is one of the biggest differences between for-profit and nonprofit communications. Not to say that for-profit companies don’t thank their customers. They obviously do. But nonprofits need to do it frequently, and differently. “Thank you” should be a consistent key message! Also, don’t make the mistake of thanking all donors the same way. Just as you’d segment audiences in the for-profit world, segmenting audiences is key in donor relations. Your communications to thank and otherwise reach your recurring donors—like those who give monthly—should be different than a one-time or annual donor. Recurring donors are highly valued. They represent a highly engaged donor, and you want to keep it that way! So thank your donors often through communications and do it well! After segmentation, it’s on to developing the tools to reach your donors. The worlds of nonprofit communications and for-profit communications are similar in a lot of ways, but one key difference is the level of intimacy. It’s not often that a customer can go to Nike and ask detailed questions about their profit and loss statement. Not so with donors. Again, transparency is one of the main factors in building trust. In partnership with your fundraising or development team, you should always be on the lookout for new and creative ways to recognize recurring donors. How can you take their vested interest in your organization up a notch? How can you offer them a unique donor experience? This can manifest in many ways. Two examples are special sneak previews and VIP receptions. How you thank donors and otherwise communicate through these tools is critical in showing them you care. In Indianapolis, the closest donors of our public radio station, WFYI, are part of “The INner Circle.” This is the station’s leadership giving society. WFYI describes it as a community of its most generous and engaged donors whose level of financial support strengthens the foundation for the work they do, which is to provide central Indiana with access to public media. Aside from unique donor experiences and events, other communication tools available to influence your audiences include social media, traditional print marketing, news media coverage and email marketing. While the tools are the same used in for-profit communications, with nonprofits the flavor and angle (the message) is what’s different. But, keep in mind your messaging when developing marketing strategies and tactics. 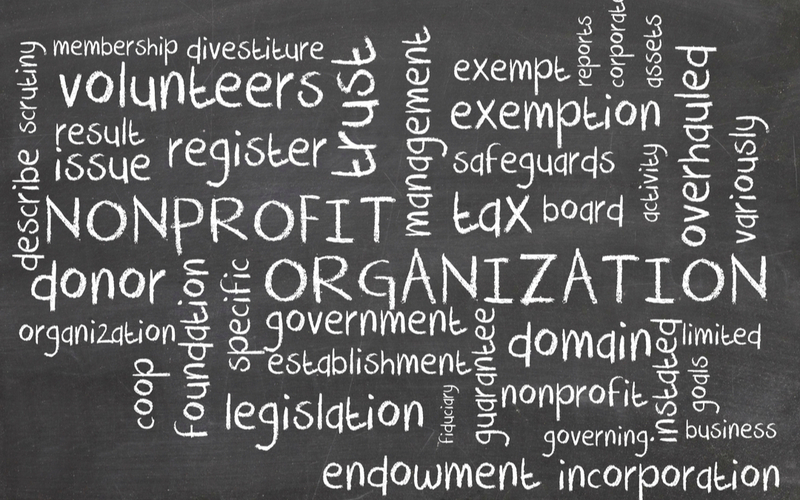 What makes sense for one nonprofit organization might not for another. Your communication tools connect to messaging. Here’s an example. Say your organizational messaging includes “building authentic relationships” and the cornerstone of your marketing and PR is a series of impersonal communications and events. That’s not authentic and could backfire over time. Finally, we think it’s important to point out that to be successful in communicating, nonprofit communicators must be in lockstep with their development directors, and vice versa. Much like marketing is connected at the hip to sales in the for-profit world. According to the 2016 Nonprofit Marketing Guide, there are key differences in what tools nonprofit communicators and their development directors value. Nonprofit communicators lean hard toward community engagement and branding. On the other hand and not surprisingly, development directors are more interested in getting direct mail appeals out. And nonprofit executive directors fall somewhere in the middle. Of the many communication vehicles available for outreach, these three positions most often have conflict around the value—in financial and time investments—of the organization’s website. It’s important to have these key stakeholders at the table when planning new marketing and communications strategies and tactics, and to keep them well-informed afterward. Strong nonprofit communications can accelerate an organization’s ability to more fully realize its mission. Some of the most important aspects are telling a succinct “story” through your mission, vision, values and messaging. Equally important are audience segmentation and communication tools or efforts that are audience-centered. These messages meet your donors, customers and employees where they are and tell them you appreciate their contributions. When the timing is right, they also invite these same audiences to become more invested. Do you have an experience you’d love to share about your work in nonprofit communications? If so, we’d love to hear it. Contact us today.